Real Time Plotting while monitoring ROP, Hotwire and Chromatograph Gases, CO2, MWD Gamma, MWD Resistivity and other data available from a WITS feed. (No spreadsheets, text or LAS files to import). Program includes Lag Calculator and Alarms (including WITS alarms). Full Set of Reports including Morning, Show and DST reports. View and print them directly from the log with just a click of the mouse. They can also be saved as PDF’s for e-mailing. Easy creation of LAS files including Version 3 which includes descriptions. Easily Save the Image as a BMP, JPEG, TIF, PDF, GIF or PNG file. Easy entering and editing of all data at any time anywhere on any log without missing any incoming data. Instantly view 1, 2 or 5 in a Vertical or Horizontal format with a click of a mouse. Project Inclination on horizontal logs with the ability to insert dip factors. Easily add descriptions, surveys, and notes to horizontal log. The Zoom Feature enables you to view the entire well and go to any depth by clicking on that part of the log. Ability to set Mudlog and E-Log Schemes. Import offset MainLog ROP curves for correlating. Ability to import Cutting Photos and other images onto the mudlog. Ability to adjust file depth to match e-log depth at end of well. Logarithmic and multiple linear scales. Formatting of Curve Style and color. Drawing of a Tops Line on both the vertical and horizontal log. Lagged Depth Marked on log to aid in one-man logging jobs. 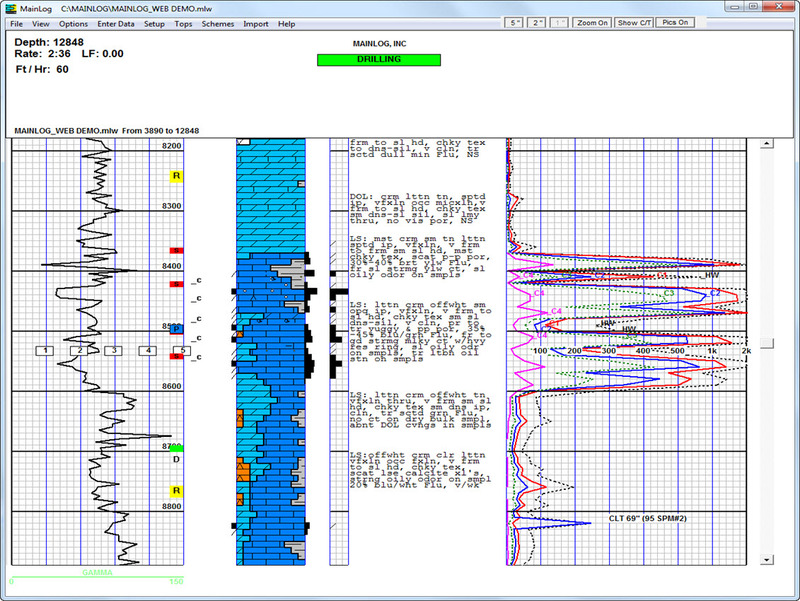 Automatic depth corrections made, with backups, when drillers make depth corrections on EDRs. Auto-drill mode when wits feed is down for getting depth. MainLog is truly a real time program in that it has the ability to read and even control some gas detection instruments and/ or read a “WITS” feed from them. It can also read and plot wits data being sent in from an EDR directly to the mudlog. 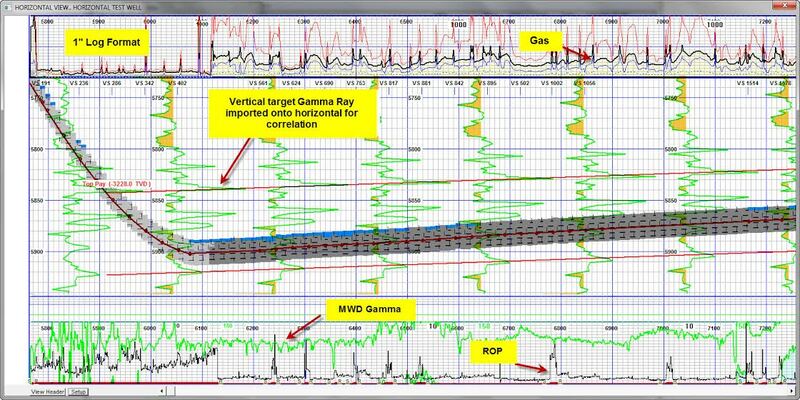 Even MWD Gamma & Resistivity can be WITS in, in real time. You are actually looking at and working with a mudlog all the time, no importing of spreadsheets, text or LAS files to delay you in the log presentation. Entering in descriptions, notes, well information, as well as editing, is all done while incoming ROP, gases and WITS data are being plotted in real time. 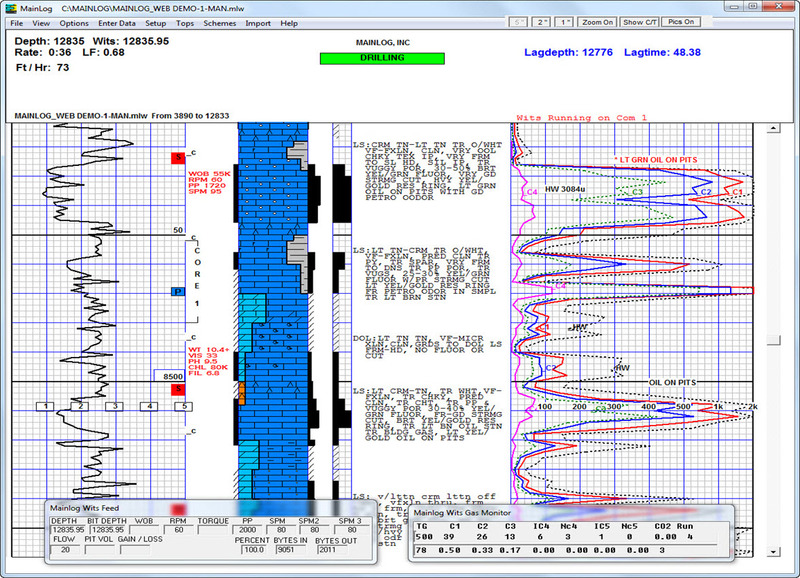 In the data acquisition mode, MainLog displays a WITS and Gas Monitor box showing the incoming data, including Real Time Gamma if available via WITS. MainLog can read directly from most gas detection instruments via a Modbus interface. In this mode a real time gas chart can be displayed showing chromatograms, the hot wire reading, depth marks, lagged depth and time. Annotations can also be made easily on the chart. It creates a 24-hour chart file that is saved and stored for review at any time, even after the well is done. After being created the morning reports can be accessed by just clicking on the letter “R” in the ROP column; the letter “S” for Show Reports, the letter “D” for DSTs, “P” for jpegs of sample photo and “ISO” for Iso-tube Reports. LAS Files can be easily created in the field or office version under the Options tab. LAS Version 3 is also available. (Includes descriptions in the LAS file) No need to create a template, as all data on the log, including gamma will be included in the LAS file. There is also an option to automatically create and send an LAS file in with the mudlog. The logger and office user can create a TIF, BMP, JPG, PNG and GIF file of the mudlog or horizontal log. A PDF file can also be created with additional software, Adobe or freeware CutePDF. 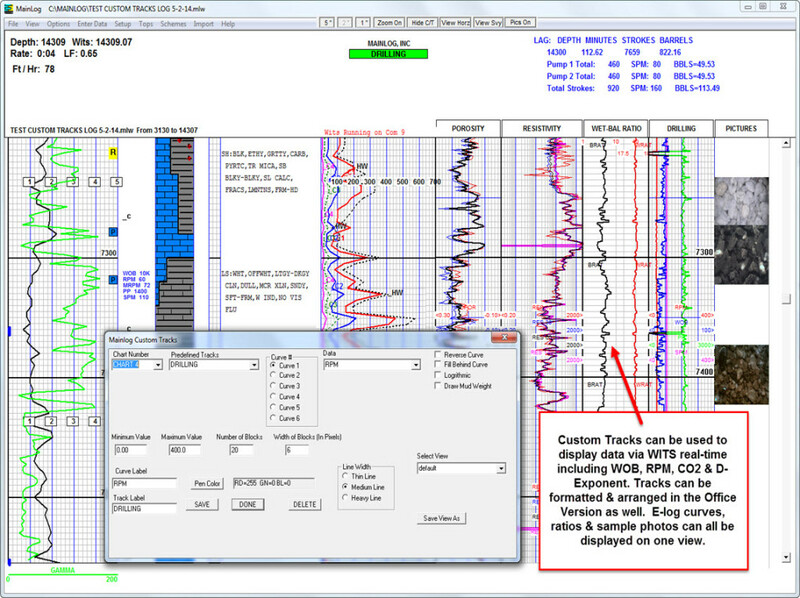 With the “Quick View” menu the user can easily view a 5″, 2″ or 1″ vertical or horizontal log, turn on Custom Tracks, view surveys and turn samples pictures on. Horizontal Logs are easily created by either manually entering-in surveys or importing them into the working mudlog. 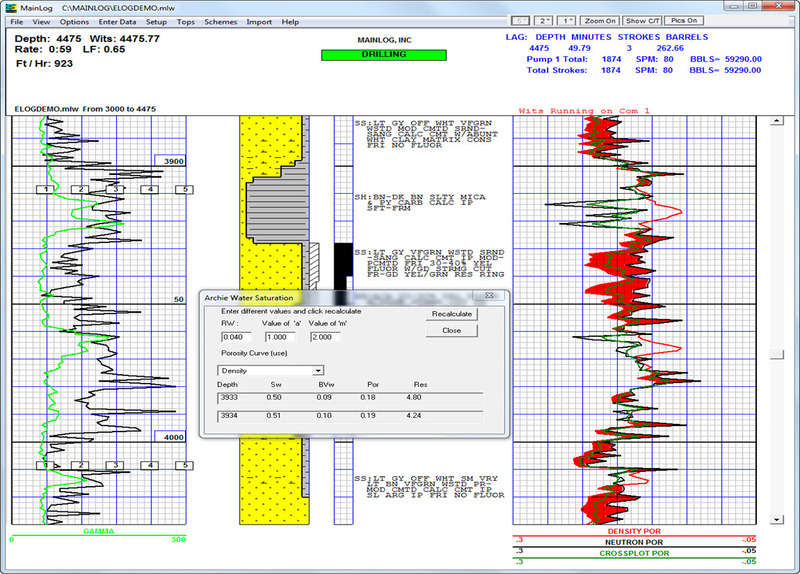 When entered in, MainLog will create the horizontal log and it can be viewed and printed in a 5″, 2″ or 1″ format. It can also be saved as a TIF, JPEG, BMP, PNG, GIF or PDF file. The five Inch horizontal is easily drawn from the working mudlog with little or no additional logger input. Redundancies such as re-writing descriptions or surveys are not necessary to create the 5, 2 or 1 horizontal. 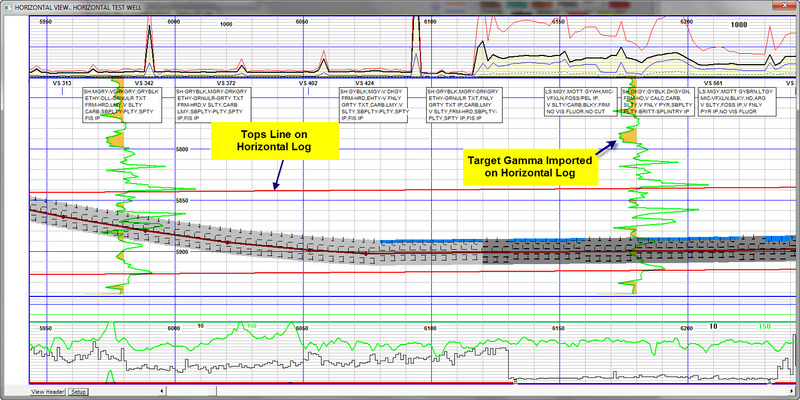 Anchor and target e-log curves can be imported onto the horizontal log to help correlate while drilling. 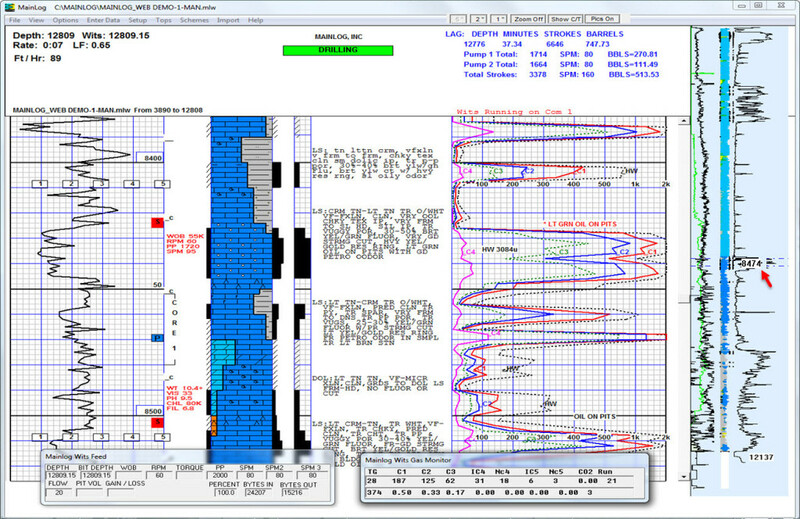 Another feature of MainLog is the ability for the logger and office geologist to import E-logs curves for correlating and even to calculate water saturations. Offset gamma ray curves can be clicked and dragged up or down to determine how high or low you are to that well. After importing the e-log curves to the mudlog file you can go to the Schemes tab and display any data contained in the mudlog or E-log curve file. There are six data sets which you can name and display with a click of the mouse. If the resistivity and porosity curves are imported the water saturations will be calculated and the user has the ability to change the values for RW, a, and m in the Archie Equation and select the depths for those values as well. 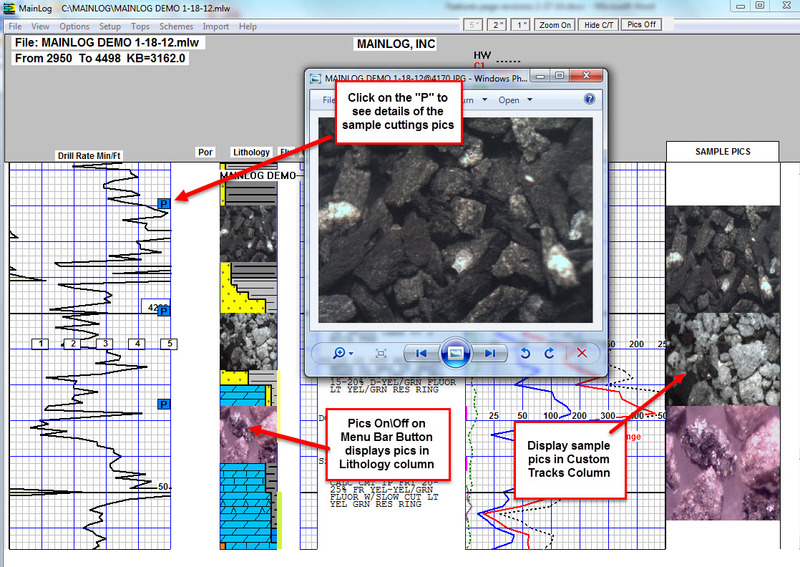 Integrating a jpeg photo of a sample cutting is as easy as naming the photo at the depth it was taken (i.e. 7020.jpeg) and copying it to the c:/MainLog directory. MainLog handles it from there and the client can easily open it once the log is e-mailed in by just clicking on the letter P in a blue box, from the mudlog. Log colors: The logger and office user has the ability to choose any color for any curve, descriptions or notes on the log. With MainLog ten additional custom tracks, with up to six data curves on each track, are available to plot additional information being WITS in such as, WOB, SPM, PP and Torque. D-Exponent can also be plotted with the correct information being WITS in. A theoretical lag can be calculated by entering the specific drilling parameters. With a wits feed from the EDR, lag can be calculated using strokes. Even down hole motors can be figured in. Alarms can be set by depth, time, high or low gas, drilling breaks, long feet and even when to catch a sample. A wits alarm can also be set up as shown below. 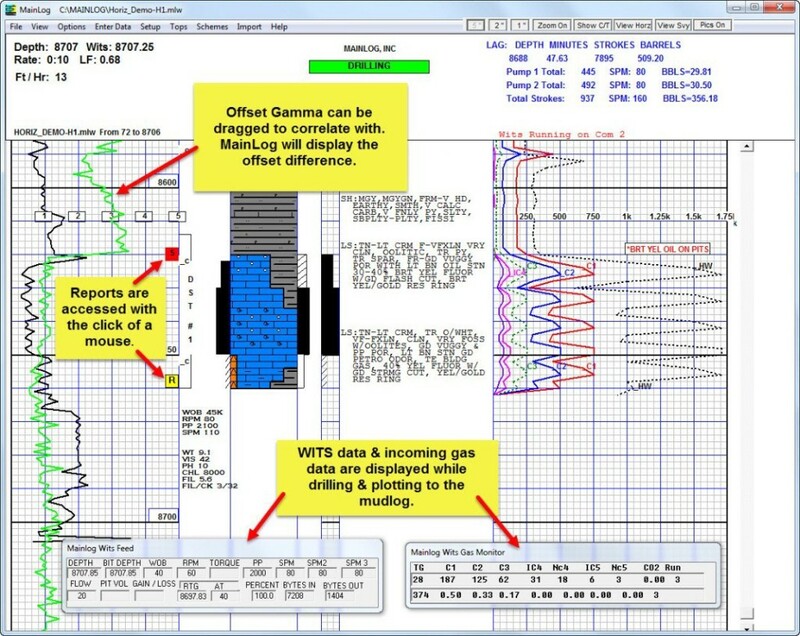 To aid in correlating on a horizontal well, projections can be made by clicking and dragging on the last survey point on the 5 horizontal log. MainLog will show the TVD at the measured depth the point was dragged to, and give the inclination to get there. 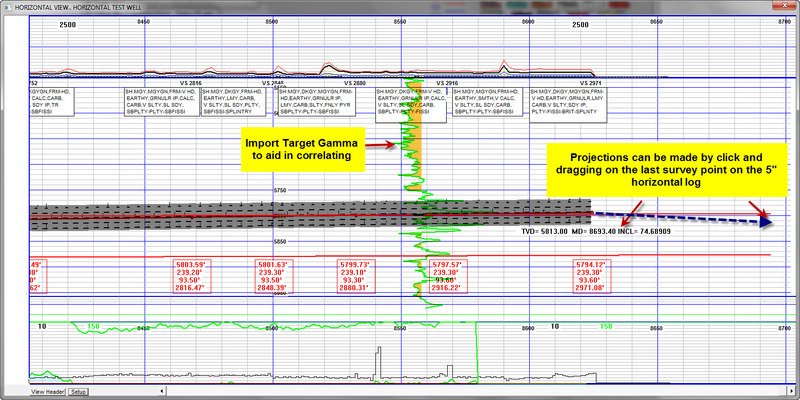 The example also shows an imported Target gamma to aid in correlating. 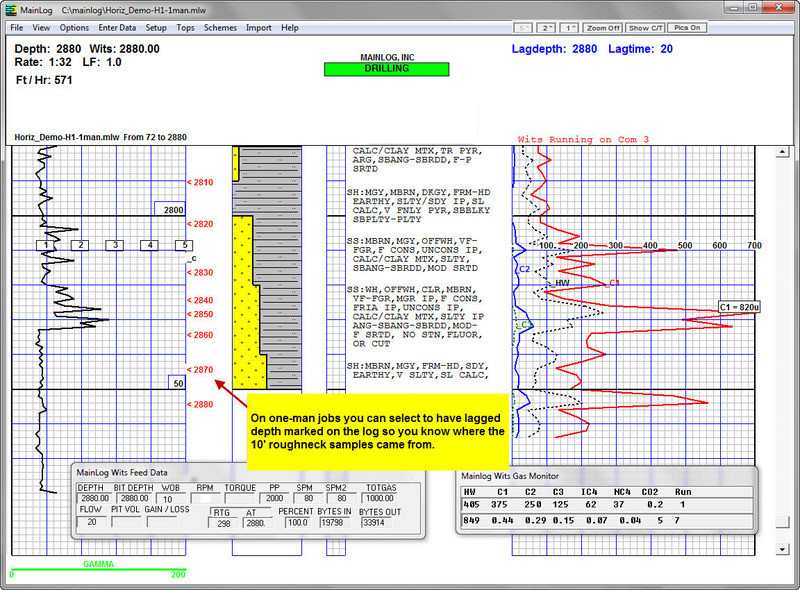 On one-man jobs, Mainlog can mark the lag depth on the log to aid the logger with rough neck caught samples. Tops lines can easily be drawn onto vertical and horizontal logs. 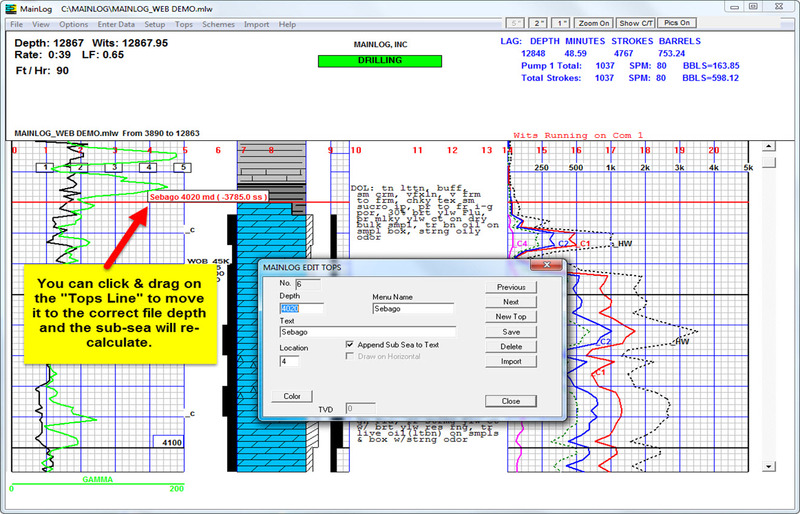 Once drawn you can click and drag on the tops Line and subsea will be recalculated. When created the Top becomes part of the Tops Menu and by selecting it will take you to that point on the log. Using the Zoom feature shows the entire well on the right side of the screen. Click on any part of the well and it will take you there on the 5-inch log. Copyright © 2015 MainLog Live. All rights reserved.